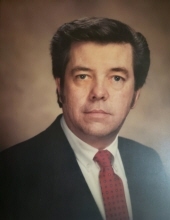 DURHAM: Larry Parrish, 78, passed away on Saturday, March 16, 2019 at Duke Regional Hospital in Durham. He was born in Durham, the son of the late Robert Clayborn Parrish and Nannie Lou Clayton Parrish. In addition to his parents, Mr. Parrish was also predeceased by his son, Larry Keith Parrish; brother, Robert Cleveland Parrish; and sister, Donna Lou Parrish. Mr. Parrish loved shopping and traveling to the beach in his free time. He enjoyed spending time with his family. Mr. Parrish is survived by his wife, Linda Parrish; daughters, Wanda Terrell (Geryl), Sereatha Griffin (Barry); son, Jeff Parrish; brothers, John Wayne Parrish, Donnie Ray Parrish; 8 grandchildren; and 10 great-grandchildren. To send flowers or a remembrance gift to the family of Larry Parrish, please visit our Tribute Store. "Email Address" would like to share the life celebration of Larry Parrish. Click on the "link" to go to share a favorite memory or leave a condolence message for the family.